How do volcanoes drive climate? A drop of volcanic activity in the early 20th century may have had a warming effect. 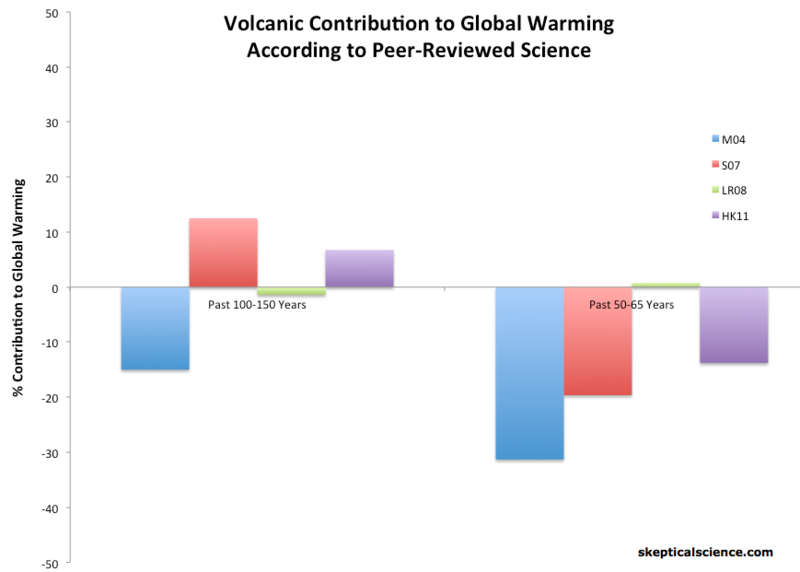 However, volcanoes have had very little impact on the last 40 years of global warming. Volcanoes emit sulfate aerosols which reflect incoming sunlight, cooling the planet. A large volcanic eruption such as the Pinatubo eruption in 1991 can have a global cooling effect of 0.1°–0.3°C for several years (Robock 1994, Zielinski 2000). Zielinksi concluded "the lack of any climatically effective volcanism in the period 1920s to early 1950s undoubtedly contributed to the overall warm conditions during those decades." (Zielinski 2000). "early 20th century warming is attributed to a composite of greenhouse warming, an uncertain contribution from solar forcing, and a recovery from a previous period of heavy volcanism"
"the lack of volcanism during the period 1925-1960 could account, at least partly, for the observed warming trend in this period". Bertrand was investigating the effect of solar and volcanic influence on climate and concluded "these are clearly not sufficient to explain the observed 20th century warming and more specifically the warming trend which started at the beginning of the 1970s". In short, a lack of volcanic activity had some part in temperature rise over the first half of the 20th century. However, it has played little part in the modern global warming trend that began in the 1970s. Foster and Rahmstorf (2011) used a multiple linear regression approach to filter out the effects of volcanic and solar activity, and the El Niño Southern Oscillation (ENSO). They found that volcanic activity, as measured by aerosol optical thickness data (AOD) has only caused between 0.02 and 0.04°C per decade warming from 1979 through 2010 (Table 1, Figure 2), or about 0.06 to 0.12°C warming of the surface and lower troposphere, repsectively, since 1979 (out of approximately 0.5°C observed surface warming). 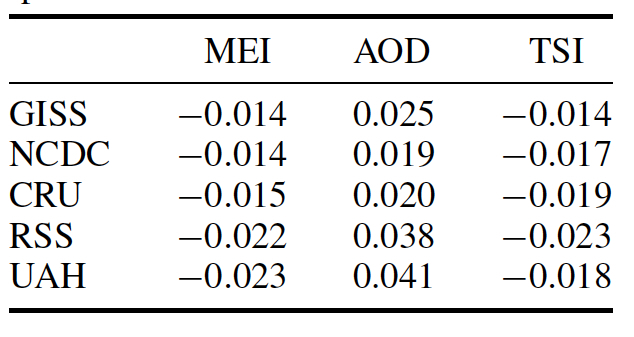 Table 1: Trends in °C/decade of the signal components due to MEI, AOD and TSI in the regression of global temperature, for each of the five temperature records from 1979 to 2010. 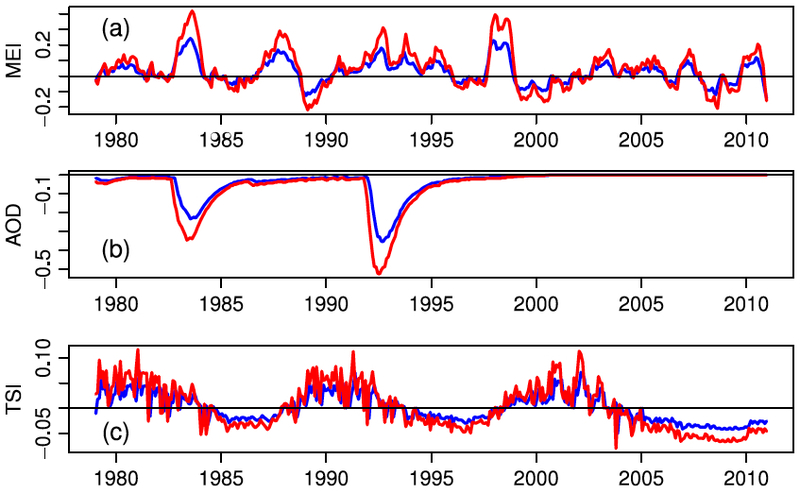 Figure 2: Influence of exogenous factors on global temperature for GISS (blue) and RSS data (red). (a) MEI; (b) AOD; (c) TSI. Like Foster and Rahmstorf, Lean and Rind (2008) performed a multiple linear regression on the temperature data, and found that although volcanic activity can account for about 10% of the observed global warming from 1979 to 2005, between 1889 and 2006 volcanic activity had a small net cooling effect on global temperatures. Thus volcanoes have not caused the long-term global warming over the past century, and can explain only a small fraction of the warming over the past 25 years. A number of studies have used a variety of statistical and physical approaches to determine the contribution of greenhouse gases and other effects to the observed global warming, like Foster & Rahmstorf and Lean & Rind. And like those studies, they find that volcanoes have had a relatively small contribution to global warming, and in fact, likely have had a net cooling effect over the past 50-65 years (Figure 3).